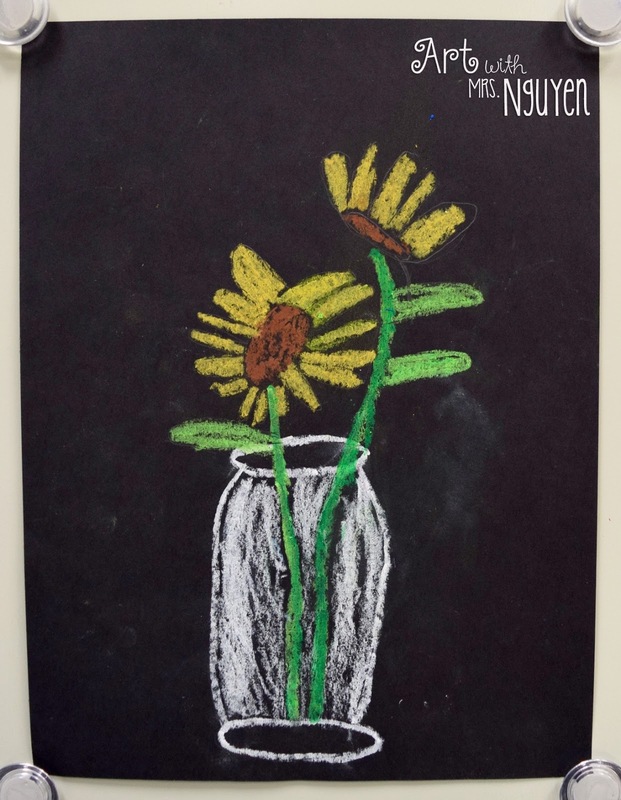 A week or so ago I posted about my Sunflower Relief Collage project - a project which takes three full 45-minute class periods. Unfortunately at my school our specials rotations are 2 OR 3 days long... so I could do it with some of my classes, but not all. 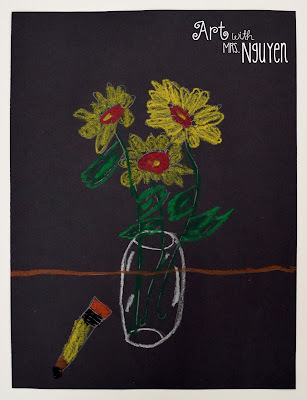 So I decided to do an alternative 2-day project based around the same themes and artist (Van Gogh still lifes)! 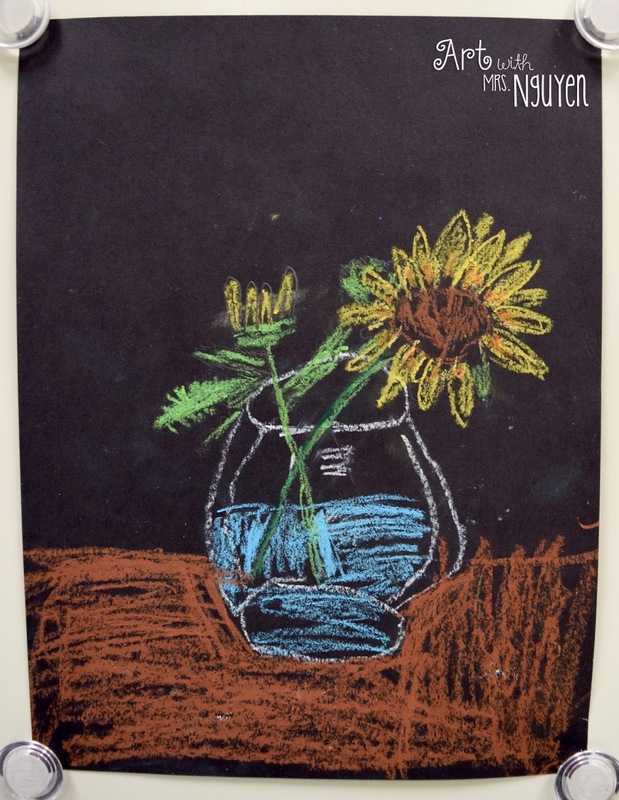 When my second graders came into my classroom I had them start at their table. I gave them a sheet of printer paper, asked them to fold it in half, and then write a #1 on the left side and a #2 on the right side. Then I asked my students to take 5 minutes and draw a picture of sunflowers in a vase. **This was BEFORE we looked at the Van Gogh still life PowerPoint. Of course I got some pushback. 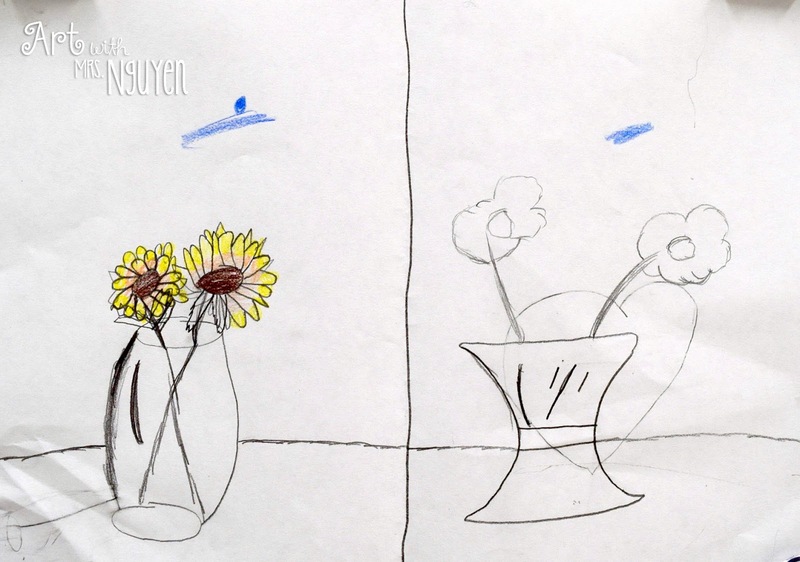 "I don't know how to draw a vase." 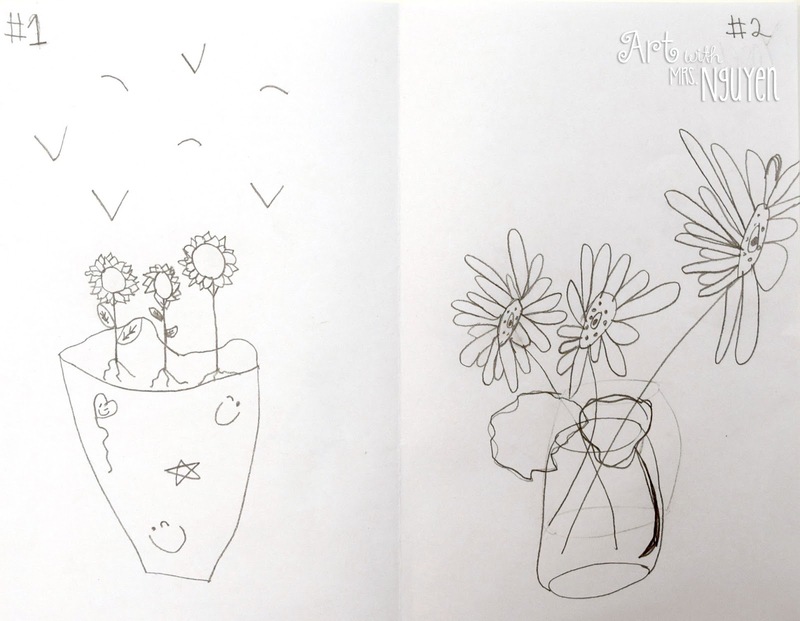 "I'm not good at drawing!" But I just continued to insist that they only needed to try their best. After five minutes'ish I had my students come and meet me on the carpet. 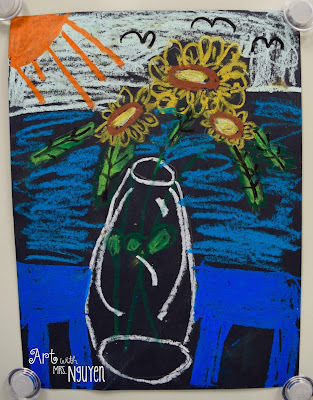 We looked at my Van Gogh PowerPoint and began talking about what still lifes are. 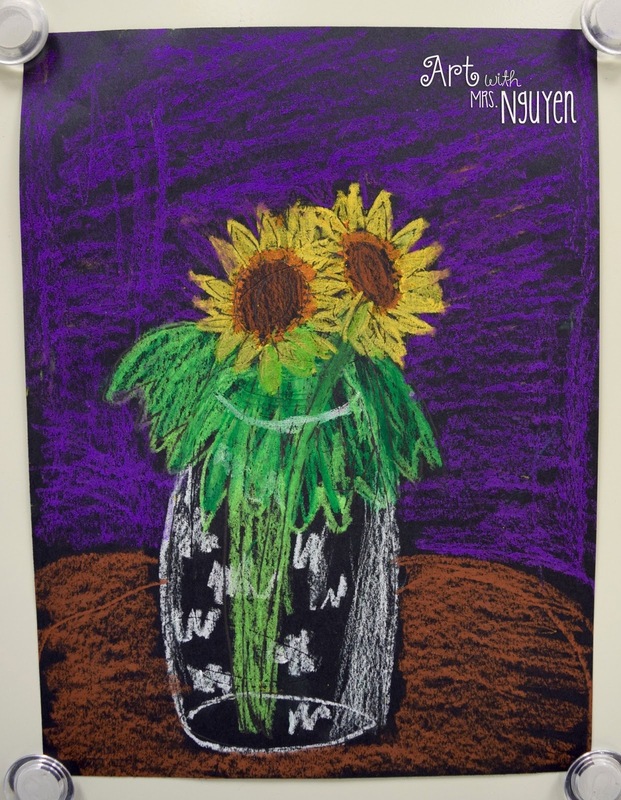 While looking at Van Gogh's artwork my students noticed that he did MANNNYYY paintings of sunflowers. 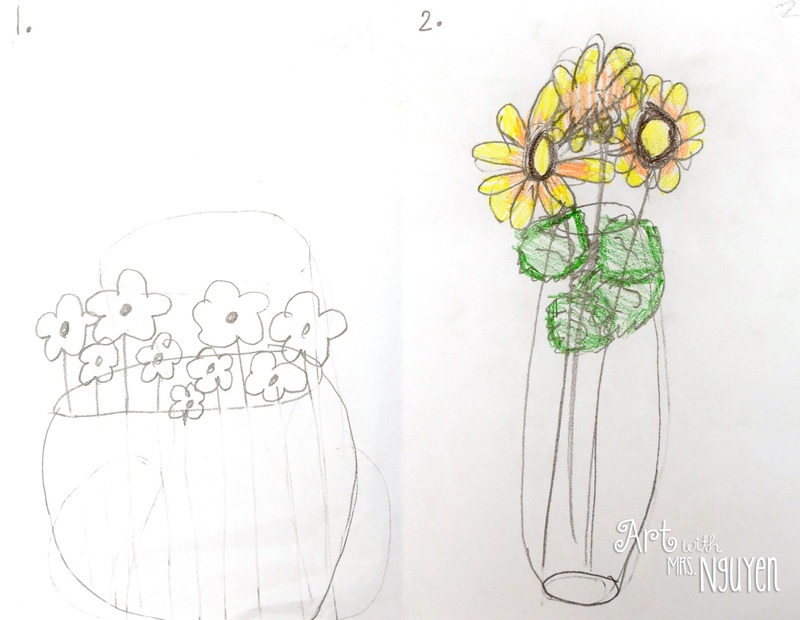 I explained to them that even great artists don't always get it right on the first try- even THEY have to try something over and over again to get it just right! 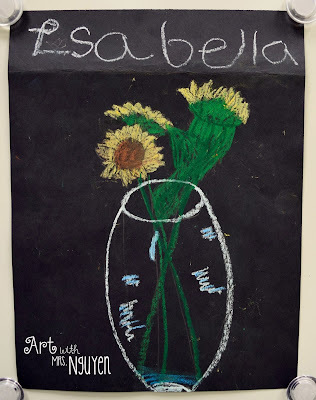 We also talked about how Van Gogh didn't try to make all his flowers look perfect. Some of them were drooping down and some were facing different directions. 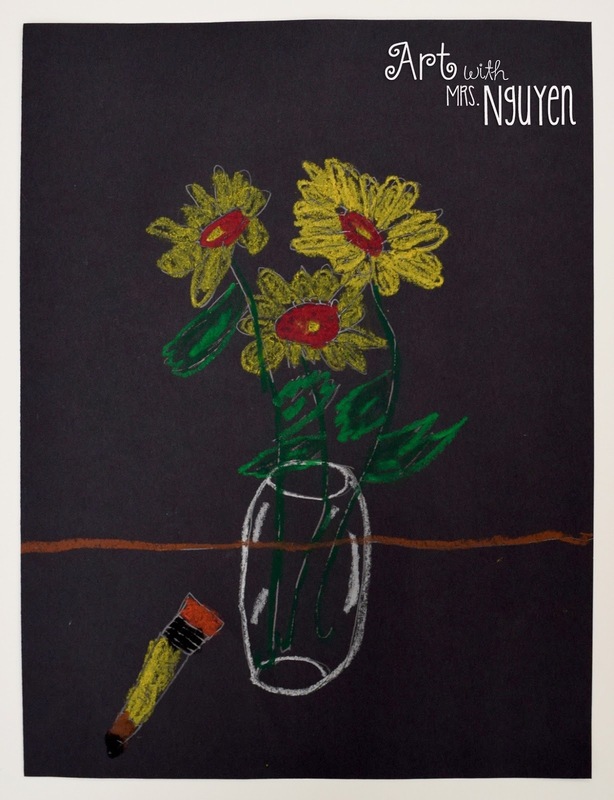 Van Gogh made his artwork while LOOKING at flowers - not just thinking about them. That's how he was able to paint with so much detail. 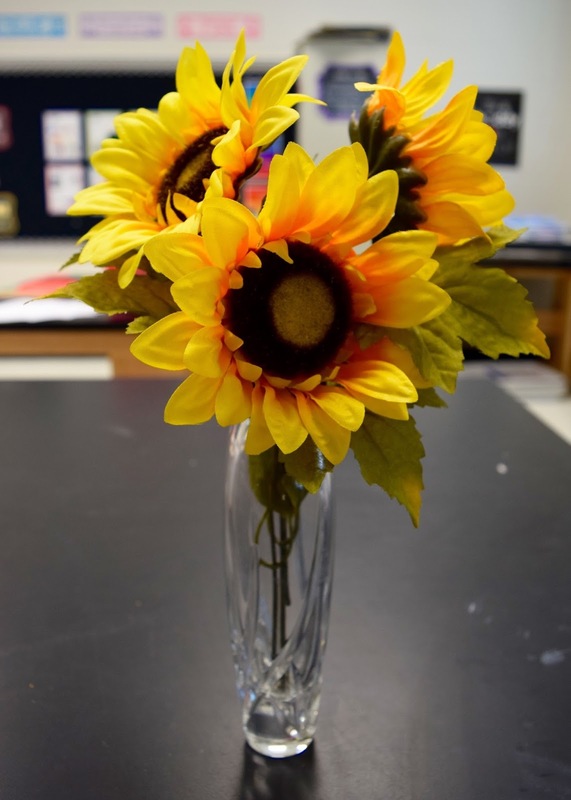 Then I had my students go back to their table and placed a vase of fake sunflowers on it. 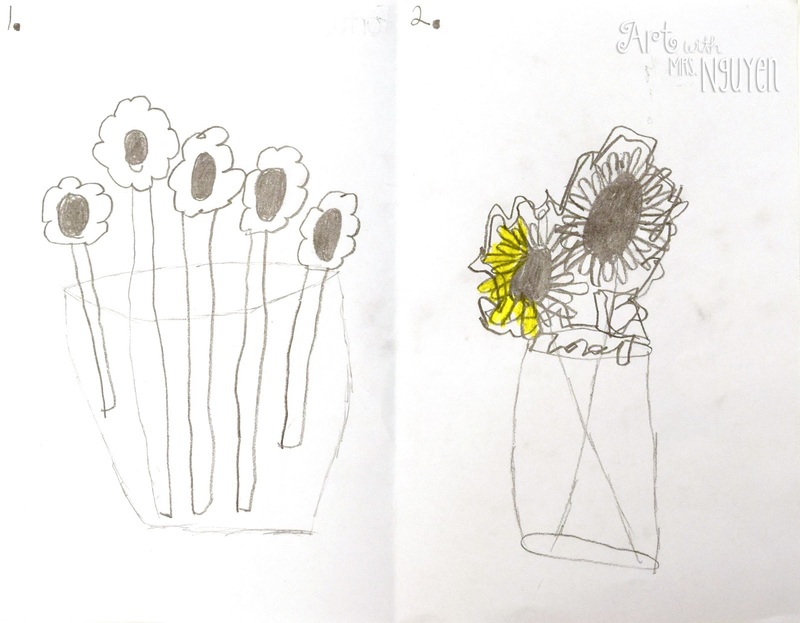 Students were asked to look at EXACTLY what they saw and draw that. I gotta say - I LOVE the transformation! 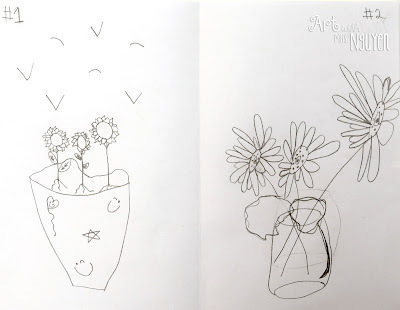 The kids were so impressed with how much they could improve their drawings within like 30 minutes! This friend drew hers on the wrong side. But HOW amazing is this progress?! 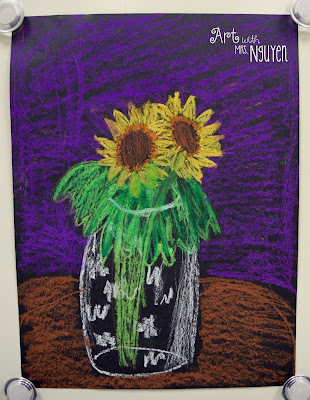 On the second day my kids came in, I had them draw another still life based on a vase of sunflowers on black paper. 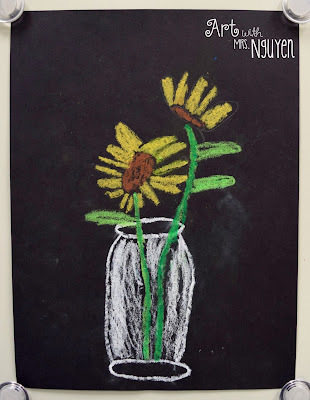 They quickly sketched out their image with pencil, then went in with oil pastels. Love how well this is scaffolded. Awesome drawing lesson. This is awesome! Any tips for guiding students when drawing still-life images for the first time? I'm assuming you did a demonstration on the 2nd day? Or how did that work. I am working on a Van Gogh Sunflower lesson plan and I like the idea of still-life, my 3rd graders have not done that before though! The demo on the second day was more or less to show them how to use the oil pastel on top of their pencil sketch. This was the first time I've ever done still life's with them. 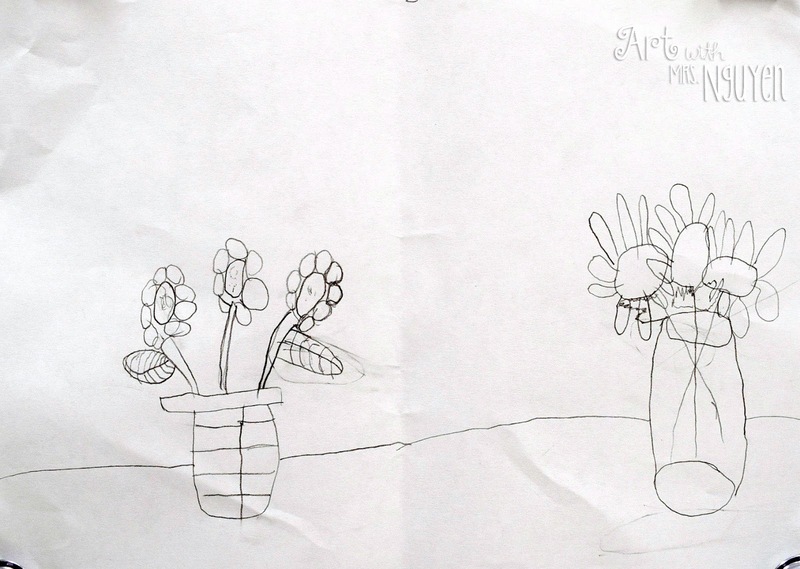 My best advice is to remind them to "DRAW WHAT YOU SEE... NOT WHAT YOU THINK YOU SEE!". 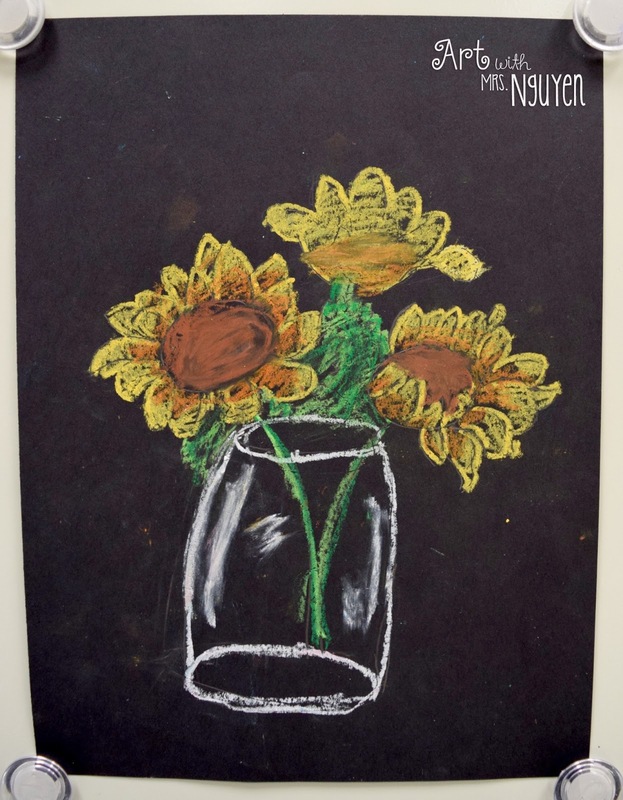 Kids have a really hard time with that because things may not look exactly right to them. Hello, do you have the PowerPoint available (for example, on Teachers Pay Teachers?) 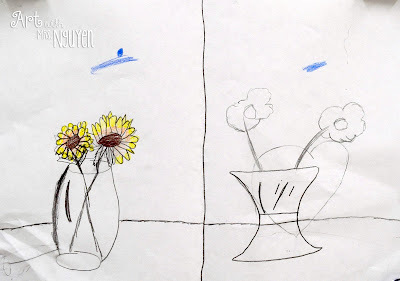 When they drew the first drawing, were they looking at some real (or realistic silk) sunflowers in a real vase? Thanks! 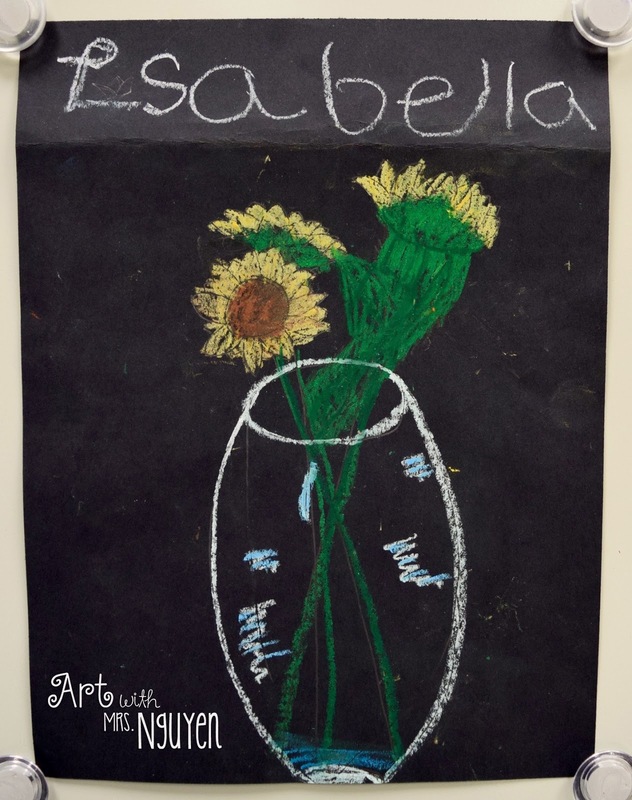 And yes.. when they were drawing the sunflowers for the second time they were looking at realistic silk sunflowers.